With a little under 5,000 year-round residents, the picturesque resort community of Jasper is the gateway for exploring one of the most spectacularly scenic parts of western Canada, Jasper National Park, which at 4,200 square miles is the largest park in the Canadian Rockies (it's roughly twice the size of Prince Edward Island). Although it's a comparatively small community, it hosts one of the top winter-time Pride events in North America: the Jasper Pride Festival, this year takes place in March - the dates are March 9 thru 12, 2017. Jasper's Gay Pride celebration comprises four days of daytime events and evening parties - here's a full calendar of events from last year's festivities, just to give a sense of what you can expect at the next event. Top activities among the more than 20 events included an opening acoustic show with Lucas Silveira, a Pride Beer party at Jasper Brewing Company, a Pride movie screening, a "Bong-Age Boylesque Show" the Sawridge Inn, the very talented Kate Reid in concert, a Lum-Bear Jack party at Whistle Stop Pub, Family Pride events, the From Jasper With Love 007 Pride Gala Party at Fairmont Jasper Park Lodge resort, and other get-togethers during the evenings; and skiing, guided ice canyon walks, ice-climbing, sledding, a "High Heels" dress-up ski competition, and snowshoeing during the days. You'll find links to purchasing tickets online for various parties and gatherings at the Jasper Pride events page. Several hotels in Jasper are hosting different events and offering special deals during Jasper Pride - the organizers have a helpful Where to Stay guide with details. Key lodging options include the swanky Fairmont Jasper Park Lodge, the collection of Mountain Park Lodges, the mid-priced Best Western Jasper Inn, the conveniently located Sawridge Inn & Conference Center, and the affordable Whistler's Inn. The local company Sundog Tours is providing daily shuttle bus service to Jasper during the Pride Festival, with options from both Calgary (via Banff) and Edmonton airports. For additional details as well as other tips on reaching Jasper, visit the festival's Getting to Jasper page. 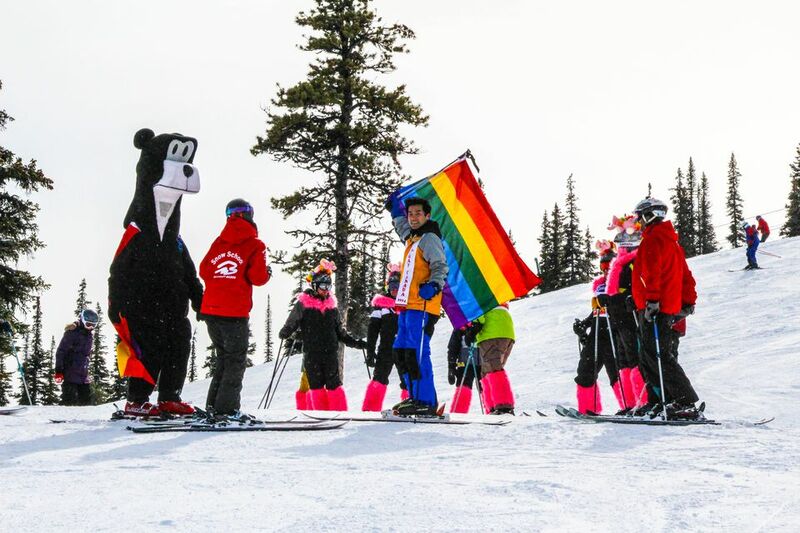 Like Whistler Winter Pride, which takes place relatively near Vancouver in late January, Jasper's event is both a Gay Pride festival and a Gay Ski Week. The event draws revelers and winter-sports fans from all over Alberta and British Columbia - Jasper is a four-hour drive north of Banff along the famously stunning Icefields Parkway, a four-hour drive due west of Edmonton, and a five-hour drive northwest of Calgary. A UNESCO World Heritage Site, Jasper National Park is a wonderful place for watching all sorts of wildlife (from caribou to grizzly bears), viewing some of the most accessible glaciers in the country, and partaking of such recreational activities as skiing and snowboarding at Marmot Basin resort in winter to hiking, canoeing, kayaking, camping, and soaking in hot springs the rest of the year. The bustling resort town of Jasper will have lots going on during its Pride Week. Check regional papers, such as Gay Calgary Magazine, which has coverage on the entire province. Also have a look at Travel Gay Canada's online directory on Alberta, which has extensive information on gay travel throughout the region; and for tourism information, Tourism Jasper, which is a major supporter of the Jasper Pride Festival, is a terrific website packed with advice on where to stay, eat, and play.